dm Server 2.0.0.M3 has been released, and is now available for download. In the sprints since 2.0.0.M3, we’ve made significant progress towards the final release, both in terms of new features, and in defect fixes. Take a look at the M3 release notes if you’re interested in seeing everything that we’ve been working on. Please keep your feedback coming as comments on our blog, in the forums, and on JIRA. dm Server now contains the OSGi Web Container reference implementation and uses and builds upon it for all of its web support. As part of this work we’ve also moved to using the standard XML format for the configuration of Tomcat in dm Server. A new Dump Inspector has been added to dm Server’s admin console. 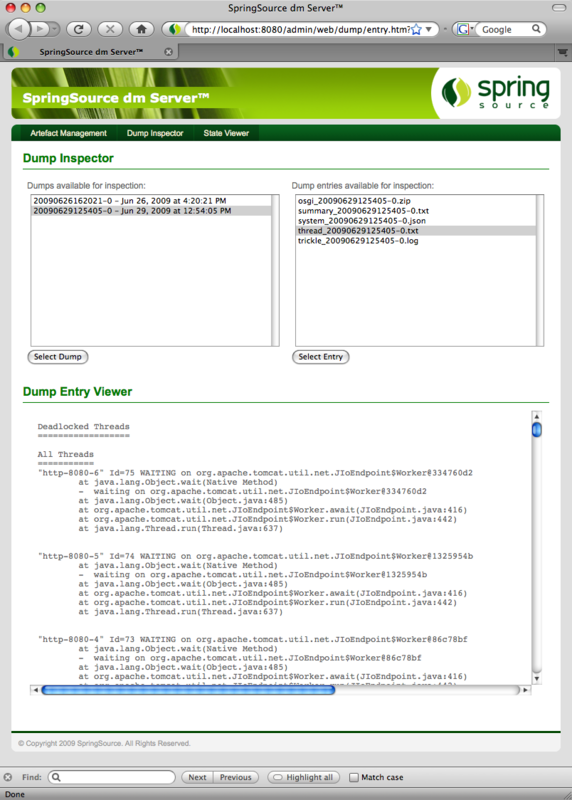 The Dump Inspector can be used to examine diagnostic dumps produced by dm Server’s serviceability component. We’ve recently moved dm Server’s source code to Git as we felt that we could benefit significantly from Git’s distributed nature and its excellent support for branches. If you’re interested in accessing dm Server’s source code, and in building dm Server from source, instructions for doing so now that the code is hosted in Git can be found below. A number of the newly-added features are now covered in the dm Server user guide and programmer guide. dm Server now makes extensive use of ConfigurationAdmin to manage its configuration. This has resulted in changes to dm Server’s configuration files and their format. The new files and format are described in the updated user guide. We’ve updated our guide to creating an enterprise Java application with dm Server to bring it up-to-date with the 2.0 line. With this setup complete you’re ready to build dm Server. The build will download all of the bundles that comprise the 2.0.0.M3 release of dm Server and package them into a install binary. You can find this binary in the target/artifacts directory. Once the build has completed a dm Server install binary, in the form of a zip file, can be found in target/artifacts.